Ipe, sometimes misspelled as epi, is pronounced (ee-pay) and is commonly found in South America. Ipe is possibly the most well known exotic hardwood in North America. It is one of the most popular choices of lumber for home owners and commercial use today. 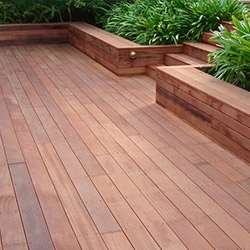 Ipe hardwood is a generally chosen for its high density and resistance to scratches, decay and insects. The lumber will last a long time, both indoors and outdoors. It is just as fire resistant as steel and remains strong as it ages. The disadvantage to this very dense is that it’s difficult to work with. Ipe hardwood does not need to be treated with any chemical sealants or finishes. Rather, a standard oil-based finish can be used once per year to seal the wood. The material’s color ranges from a deep brown to yellow-brown with grey undertones. Before using, make sure the ends of the wood are waxed before cutting to decrease the risk of end checking. Before screwing anything into Ipe hardwood it is a good idea to pre-drill all the holes. The wood will not crack or split while using nails and screws if the wood has been properly pre-drilled. One advantage to using this material is that the tight grains will hold nails and other hardware securely in place. As a result of its tight grains, there are little to no slivers on the surface so you can walk around your new deck in bare feet without worry. Ipe hardwood can last up to 40 years and is twice as strong as Oak wood. The installation is more difficult than our other products but is still easy maintain. It is considered to be one of the most popular wood choices for homeowners because it can withstand harsh conditions while maintaining its structural integrity. For more information on ipe hardwood or to order, call Us at 1-888-973-0073 or use the contact form on our contact us page.